This topic describes how Pivotal Cloud Foundry operators can visually brand Apps Manager by changing certain text, colors, and images of the interface. Developers view the customized interface when logging in, creating an account, resetting a password, or using Apps Manager. Operators customize Apps Manager by configuring the Custom Branding and Apps Manager Config pages of the Pivotal Application Service (PAS) tile. In a browser, navigate to the fully qualified domain name (FQDN) of your Ops Manager and log in. Click the Custom Branding tab. For Company Name, enter the name of your organization. If left blank, the name defaults to Pivotal. For Accent Color, enter the hexadecimal code for the color used to accent various visual elements, such as the currently selected space in the sidebar. For example, #71ffda. For Main Logo, enter a Base64-encoded URL string for a PNG image to use as your main logo. The image can be square or wide. For example, data:image/png;base64,iVBORw0.... If left blank, the image defaults to the Pivotal Logo. For Square Logo, enter a Base64-encoded URL string for a PNG image to use in the Apps Manager header and in places that require a smaller logo. For example, data:image/png;base64,iVBORw0.... If left blank, the image defaults to the Pivotal Logo. For Favicon, enter a Base64-encoded URL string for a PNG image to use as your favicon. For example, data:image/png;base64,iVBORw0.... If left blank, the image defaults to the Pivotal Logo. For Footer Text, enter a string to be displayed as the footer. If left blank, the footer text defaults to Pivotal Software Inc. All rights reserved..
For Link text, enter a label for the link. For Url, enter an external or relative URL. For example, http://docs.pivotal.io or /tools.html. For Classification Header/Footer Background Color, enter the hexadecimal code for the desired background color of the header and footer. For Classification Header/Footer Text Color, enter the hexadecimal code for the desired color of header and footer text. For Classification Header Content, enter content for the header in either plain text or HTML. If you enter HTML content, eliminate white spaces and new lines. If you do not provide any content, the custom header will not appear. For Classification Footer Content, enter content for the footer in either plain text or HTML. If you enter HTML content, eliminate white spaces and new lines. If you do not provide any content, the custom footer will not appear. 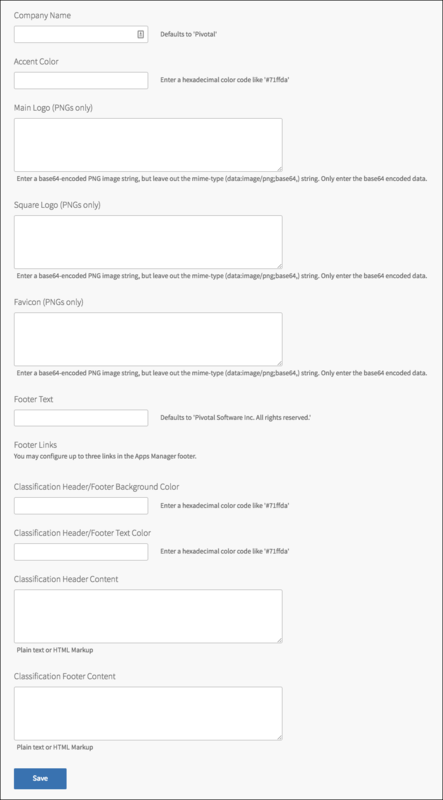 The Classification footer appears below the normal footer, which you can customize in the Footer Text and Footer Links fields. Note: The Header and Footer do not appear on the User Account and Authentication (UAA) login page. Click the Apps Manager Config tab. 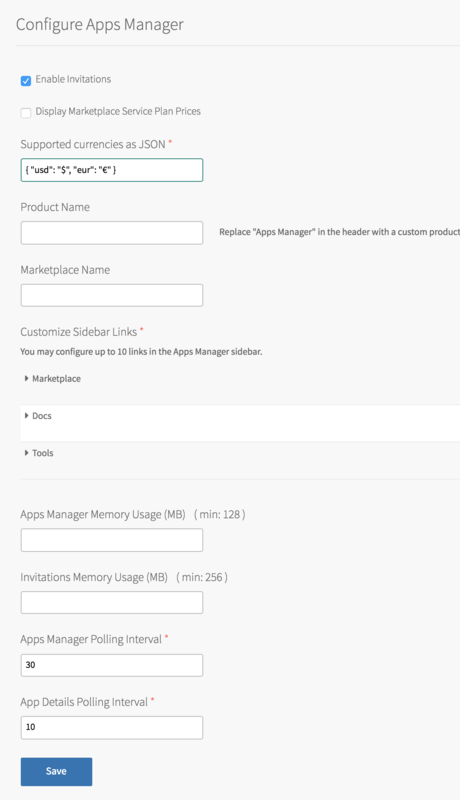 For Product Name, enter text to replace Apps Manager in the header and the title of Apps Manager. This text defaults to Apps Manager if left blank. For Marketplace Name, enter text to replace the header in the Marketplace pages. This text defaults to Marketplace if left blank. By default, Apps Manager includes three sidebar links: Marketplace, Docs, and Tools. You can edit existing sidebar links by clicking the name of the link and editing the Link text and Url fields. Or, you can remove the link by clicking the trash icon next to its name. If you want to add a new sidebar link, click Add and complete the Link text and Url fields. Note: Removing any of the default links will remove them from the sidebar for all users. (Optional) Enter your desired Apps Manager Memory Usage in MBs. The minimum number you can enter is 128. (Optional) Enter your desired Invitations Memory Usage in MBs. This is the memory limit used to deploy the Invitations app. The minimum number you can enter is 256. Increase the polling interval above the default of 30 seconds. Note: If you enter a value between 0 and 30, the field is automatically set to 30. Disable polling by entering 0. This stops Apps Manager from refreshing data automatically, but users can update displayed data by reloading Apps Manager manually. Increase the polling interval above the default of 10 seconds. Note: If you enter a value between 0 and 30, the field is automatically set to 10.